US Secretary of State Rex Tillerson was the subject of brazen North Korean ‘surveillance’ on Friday, hours before he talked up military intervention as a possible course of action against the nation. President Donald Trump’s secretary of state is currently on an official visit to South Korea in an effort to address the “nuclear threat” of the neighboring nation ruled by Kim Jong-un. Tillerson’s tour took him to the surreal surroundings of Panmunjom. 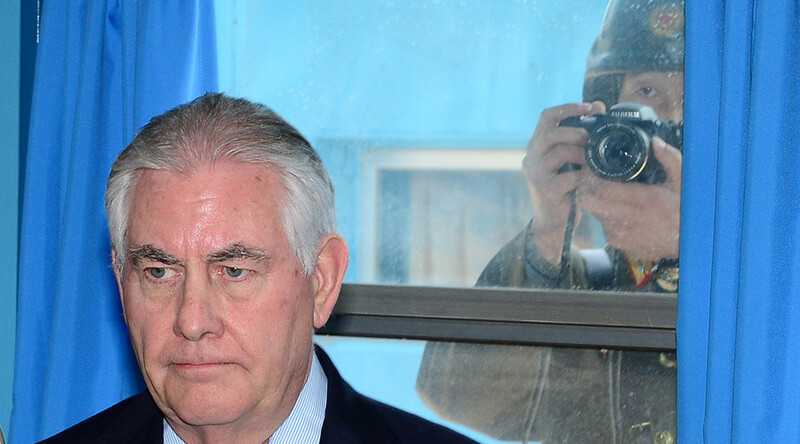 The area is a border village located in the demilitarized zone (DMZ) of the Korean Peninsula, where on Friday the former Exxon Mobil chief was also bizarrely photobombed by a camera-wielding North Korean soldier. An image of the incident has provoked humorous comment online and came just before Tillerson described military action as an “option on the table” for dealing with North Korea threats at a news conference in Seoul. @BraddJaffy@PurlLeslie And, like any vampire, it turned out to be a picture of nothing. @BraddJaffy I thought this was photoshopped at first but seriously why stand in front of the window? Following Tillerson’s visit to the DMZ, the secretary of state said that “strategic patience” had ended with regard to North Korea’s weapons development. “Let me be very clear. The policy of strategic patience has ended. We are exploring a new range of diplomatic, security and economic measures,” Tillerson said.